UPPSC Pre Exam Marks 2018 Check Here. UPPSC Pre Exam Result 2018 Check Here. UPPSC GS Answer Key 2018 Set A/ Set B/ Set C/ Set D.
UPPSC Hindi Answer Key 2018 Set A/ Set B/ Set C/ Set D.
UPPSC Samiksha Adhikari RO/ARO Main Admit Card Check Here. UPPSC Mains Exam Postponed Notice 2018 Check Here. UPPSC Notification is out. UPPSC is recruiting for 460 Samiksha Adhikari RO/ARO Mains Form Govt Job Posts. You can check UPPSC - Uttar Pradesh Public Service Commission last date, download UPPSC notification, visit UPPSC official website and check other UPPSC Vacancy details.Complete Vacancy and recruitment Details about 460 Samiksha Adhikari RO/ARO Mains Form Govt Job vacancies in UPPSC are provided below by JobSarkari.Com only for you. Last Date of Apply Online. 18/01/2019. Last Date of Pay Application Fee. 18/01/2019. Last Date of Receipt Application Form. 28/01/2019. Date of Mains Examination. 17/02/2019 to 20/02/2019. Samiksha Adhikari. Candidate Must Have Passed Preliminary Examination. 460. 1. Candidate Can Apply Through Online And Offline Mode. 3. Candidate Need to Fill All the Details in Application Form And Need to Upload All Mandatory Documents On or Before 18th January 2019. 4. Candidate Need to Send the hard Copy on Given As Mentioned in Notification on or Before 28th January 2019. Q. 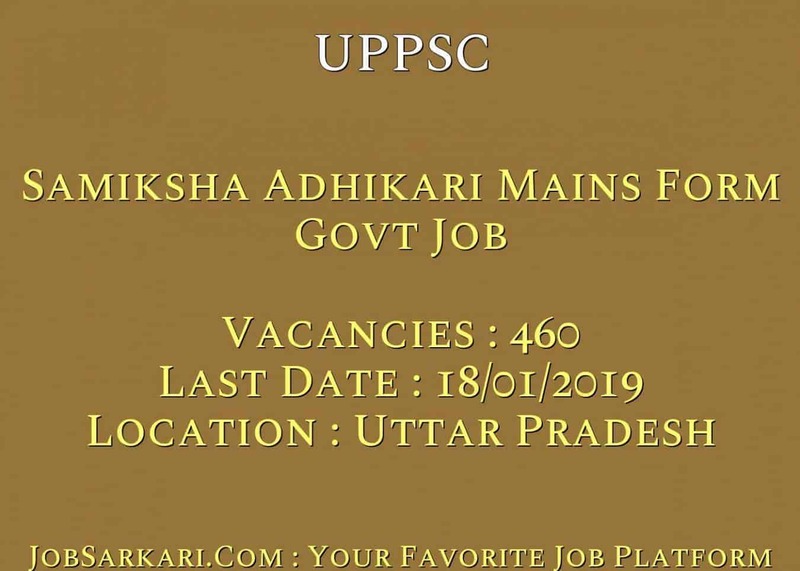 What is the Last Date For UPPSC Samiksha Adhikari RO/ARO Mains Form Govt Job Vacancy ? A. 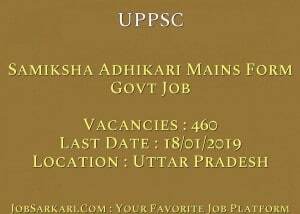 Last Date for UPPSC Samiksha Adhikari RO/ARO Mains Form Govt Job Posts is 18/01/2019. Q. What is the Form Type of UPPSC Samiksha Adhikari RO/ARO Mains Form Govt Job Recruitment ? A. The Form Type for UPPSC Samiksha Adhikari RO/ARO Mains Form Govt Job Posts is Offline, Online. Q. How many vacancies are available in Uttar Pradesh Public Service Commission Samiksha Adhikari RO/ARO Mains Form Govt Job Posts ? A. There are about 460 Vacancies in Uttar Pradesh Public Service Commission Samiksha Adhikari RO/ARO Mains Form Govt Job Posts. Q. What is the Full Form of UPPSC ? A. Full Form of UPPSC is Uttar Pradesh Public Service Commission .